Arcadia was in ancient Greece the only part of land not directly connected to the sea. So naming a ship after this mountainous and small, low populated area is not very likely. But P&O did, actually, this ship is now the 4th ship with this name. In Greek mythology, the region of Arcadia was the hunting ground for, among others, Artemis after who P&O named another of their recent ships. Arcadia seen passing Velsen-Noord at the 18th of june 2015. In a few months time, she will also recieve the new colours of P&O Cruises. The fourth ship carrying the name Arcadia for P&O was built at the wharf of Fincantieri at Marghera, Italy. Originally, she was ordered in the year 2000 as a unit of the Vista class and intended for the fleet of Holland America Line. In 2003 however, she was transferred to Cunard Line with the intention to bring her into service as Queen Victoria. Building her started at the 12th of july of that year and her design was modified from the original Holland America design to fit better in the fleet of Cunard Line. For example her funnel was based on the funnels seen on Queen Elizabeth 2 and Queen Mary 2. Also, her interiours had to have a classic Cunard Line style. But shortly before her launch, it was decided that Cunard Line needed a ship that was slightly bigger and still more different from other Vista class ships, so the mostly finished Queen Victoria was rebranded to the fleet of P&O Cruises. So technically, she still is a ship designed for Cunard Line, only in P&O colours. Her tonnage is measured at 86.799 and this makes her bigger then her near Holland America sisters. Her lenght is 289,90 meters, her width is 2,20 meters and he draft is 8 meters. She can sail with up to 2388 passengers, served by 976 crewmembers at 11 decks. Her yardnumber has been 6078 during the building process. She now flies the Bahamian flag with her homeport being Hamilton, making it possible to host weddings on board, something that is not possible when she was registered at Southampton or London. Below is the newest Arcadia, the former Cunard ship Queen Victoria. She is seen at Rotterdam at the 27th of may in 2005. The ship floated out as the Arcadia at the 26th of june 2004. During this ceremony, a key role was given to Sabrina Dunkerley, student at the Warsash Maritime Academy at Southampton and one of the youngest cadets of the company. She had the honour to place a coin beneath she ships mast, together with David Dingle, the managing director for Carnival UK. This ceremony is a tradition, dating back to Roman times bringing a ship and its passengers and crew good luck. After this coin-placing, Sabrina Dunkerley was able to perform an Italian tradition also, by sending down a bottle of champagne crashing against the ships bow. To Italian custom, after this ceremony water can be poured into the dock so the ship is able to float out of the dock. It sounds like a naming ceremony, which it isn't. It is just a signal that the ship is ready for the floatout. 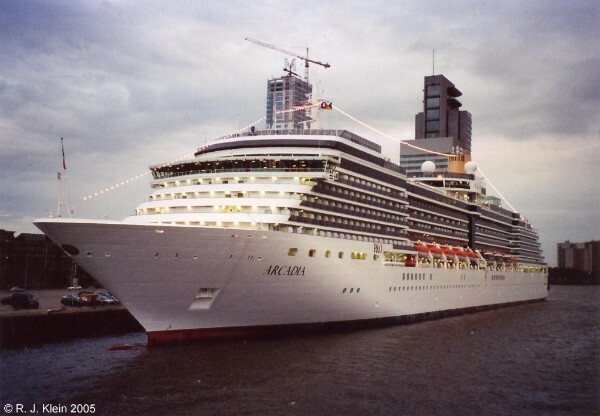 Arcadia was delivered to P&O Cruises at the 29th of march 2005 and named by Dame Kelly Holmes at Southampton. Although the ship is dedicated to the British market, she sails worldwide cruises. Her first cruise was a Mediterranean cruise, departing from Southampton at the 4th of april. The ship has a large observation lounge with panoramic views midships, called the Crow's Nest. She also feautures a British styled pub called 'The Rising Sun', named after the logo P&O is using. The ship is also a sailing art museum, as around 3000 pieces of modern British art are displayed on board, made by 50 of the most celebrated contemporary artists of Great Britain. Very common for P&O, she is designed as an adults only ship, so children below the age of 18 are not able to cruise with Arcadia. This sounds not very inviting, but at least for people who like to enjoy a more quiet cruise without screaming children around, this ship makes a great option. Arcadia is also the first ship within the P&O Cruises fleet that introduces the New Horizons programme. This is a series of talks, demonstrations and practical sessions in which passengers can go on a journey of self discovery. In this program, passengers can develop new skills while at the same time enriching their time aboard. The chance for passengers to expand their interests, understand more of the world and experience a new cultural activity has become a popular element of today's cruise holiday experience and the New Horizons programme takes this into new places in the 21st century. The ships carreer hasn't seen many major events, with the exception of the arrest of four drug smugglers (between the ages of 19 and 41) in october 2008. The arrest was made when the ship returned at Southampton from a 23-day Caribbean cruise. All four of them were sentenced for 12 years in prison. At the end of november of 2008, Arcadia was sent to the Lloyd Wharf at Bremerhaven, Germany for a total rebuilding of the stern section. In this refit, she lost her original profile of slightly stepped aft decks and this was not an improvement of her looks. Some 34 new cabins were added here, in the same manner as the stern refits that were carried out on her Holland America near sisterships. But at least it seemed that her passengernumbers were increasing because of this addition, because P&O again sent the ship back to Bremerhaven, leaving Southampton at the 25th of november 2013 for another addition of 23 cabins (and one suite) on deck 10 in a new deckhouse. Luckily, this addition, with a new 'sun basin' atop of the deckhouse, doesn't spoil her looks too much. At least several more people can now enjoy Arcadia and everything she has to offer.